I’d had my eye on this recipe for a while. I have mixed feelings about okra. I’ve enjoyed it in Indian restaurants but don’t like the texture when it goes slimey. I’m really not too sure what I thought about this recipe either so I’ve decided to mention it here to see if anyone has any suggestions about it. Firstly, I think I might have burnt the sambal a bit. I didn’t cook it for as long as it said but as you can probably see from my picture compared to his mine is much browner. It didn’t taste burnt as such, just unusual. Also, I think I’m particularly sensitive to tamarind because quite often I find recipes that include it a bit too sour. That could also be because I’m using tamarind concentrated paste and I’m not quite sure how much that equates to the tamarind used here. 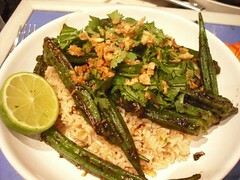 Overall, it was a very interesting dish and I really enjoyed cooking with okra for the first time I can remember. I liked the dried onions too and will be looking for other ways to use the rest of the bag.